Colorado Springs, Colo. - The Oklahoma City Dodgers posted victories in two must-win road games against the Colorado Springs Sky Sox Monday to complete an incredible comeback and win the PCL American Northern Division title at Security Service Field. The Dodgers defeated the Sky Sox, 7-1, in Game 1 and, 16-4, in Game 2 Monday on the last day of the PCL regular season. After losing the series opener Friday in Colorado Springs, the Dodgers trailed the Sky Sox by 2.5 games in the division standings and would have been eliminated from playoff contention with one loss. Instead, Oklahoma City put together four straight wins in elimination games over two days to clinch its third division title in the last four seasons. 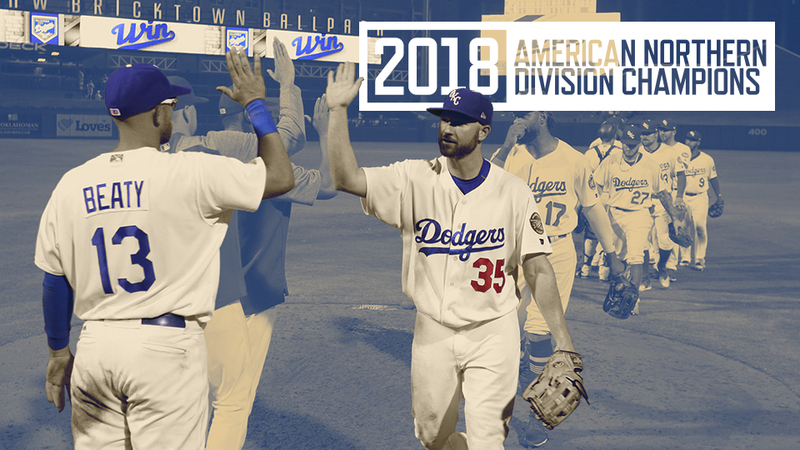 The Dodgers (75-65) will now face the defending PCL champion Memphis Redbirds in a best-of-five American Conference Championship playoff series starting at 7:05 p.m. Wednesday at Chickasaw Bricktown Ballpark. Oklahoma City's offense combined for 23 runs and 26 hits over 14 innings Monday. Henry Ramos went 6-for-8 with three RBI and three runs scored over the two games combined. Connor Joe went 3-for-5 with four RBI and five runs scored in the doubleheader. Matt Beaty had three hits and five RBI, while Jake Peter had four hits and scored four runs Monday. The Dodgers won the first game of the day, 7-1, as Edwin Ríos and Beaty combined to drive in six of the Dodgers' seven runs. The Dodgers grabbed the game's first lead on a RBI double by Ríos to the wall in left field for a 1-0 advantage. Later with two outs and two runners on, Beaty doubled into left field to bring home two more runs for a 3-0 Dodgers advantage. Oklahoma City tacked on a run in the third inning when Beaty hit his second RBI double of the game for a 4-0 Dodgers lead. The Sky Sox (73-66) loaded the bases in the bottom of the third inning with one out and brought home a run on a fielder's choice to cut the Dodgers' lead to 4-1. Colorado Springs loaded the bases again in the bottom of the fourth inning, as three straight Sky Sox batters reached base with two outs before Dodgers pitcher Josh Sborz entered the game and got Nate Orf to fly out to end the inning. Oklahoma City then took a 5-1 lead in the fifth inning. Joe led off with a walk, advanced to second base on a groundout by Ramos and to third base on a fly out by Donovan Solano. Then with Joe on third base and Kyle Garlick at the plate, Sky Sox reliever Bubba Derby threw a wild pitch that allowed Joe to score for a four-run Oklahoma City lead. For the third straight inning, the Sky Sox loaded the bases in the fifth with two outs, but Rymer Liriano grounded out to end the frame and keep Oklahoma City in front, 5-1. The Dodgers loaded the bases in the top of the seventh inning on two walks and a single by Ramos with none out. Later with one out, Ríos came up to bat and hit a two-run single to center field for a 7-1 Oklahoma City lead. Five Dodgers pitchers combined to hold the Sky Sox to just one run and nine hits in the first game, with reliever Zach McAllister (1-1) picking up the win by retiring all four batters he faced over the fifth and sixth innings. Colorado Springs starting pitcher Freddy Peralta (6-2) was charged with the loss, allowing three runs and four hits over 2.0 innings, as the Sky Sox outhit OKC, 9-8. In Monday's second game, the Dodgers' offense started early once again. The Dodgers loaded the bases with two outs in the top of the first inning and Beaty connected on a two-run single for a 2-0 advantage. Colorado Springs loaded the bases with none out in the bottom of the inning. Then with Christian Bethancourt at the plate, a wild pitch by Dodgers starting pitcher Daniel Corcino allowed Dylan Moore to score from third base and cut the Dodgers' lead to 2-1. With runners at second and third base, Bethancourt then hit a sacrifice fly to left field to tie the game, 2-2. The first four batters of the second inning reached base for the Dodgers, including back-to-back RBI singles by Joe and Ramos for a 4-2 lead. Oklahoma City then brought home another run when Solano grounded into a double play for a 5-2 advantage. The Dodgers loaded the bases again in the top of the third inning before Joe hit a two-run single. Ramos followed a single and Peter scored on a Colorado Springs' throwing error to take an 8-2 lead. Joe's RBI double in the fifth inning pushed the Dodgers' lead to 9-2. Solano later added a sacrifice fly in the inning for a 10-2 lead. Meanwhile, Dodgers relievers Manny Bañuelos and Michael Johnson combined to keep the Sky Sox off the scoreboard from the second through fifth innings before Colorado Springs' Emilio Bonifacio hit a RBI double in the sixth inning to cut Oklahoma City's lead to 10-3. The Dodgers added six more runs in the top of the seventh inning. Ramos hit a two-run double before a sacrifice fly by Solano and three-run homer by Travis Taijeron for a 16-3 lead. Moore hit a solo homer in the bottom of the seventh inning to make the final score, 16-4, as the Dodgers outhit Colorado Springs, 18-6 in the game. Bañuelos (9-7) pitched scoreless second and third innings for the Dodgers, allowing just one hit to pick up the win on the mound for Oklahoma City. Colorado Springs starting pitcher Paolo Espino (4-5) was charged with the loss, allowing five runs and seven hits over one inning. With victories in four straight games, the Dodgers won their final series in Colorado Springs, 4-1, as the Sky Sox franchise will move to San Antonio starting with the 2019 season. The Dodgers' season continues with the first round of the PCL playoffs starting at 7:05 p.m. Wednesday with Game 1 against Memphis at Chickasaw Bricktown Ballpark. Game 2 of the best-of-five series is scheduled for 7:05 p.m. Thursday at Chickasaw Bricktown Ballpark before the series continues with Game 3 in Memphis Friday. Playoff tickets will be available through the OKC Dodgers ticket office located on South Mickey Mantle Drive starting at 10 a.m. Tuesday, by phone at (405) 218-2182, or by visiting okcdodgers.com. Live radio coverage of Wednesday's playoff game begins 15 minutes before first pitch on AM 1340 "The Game," 1340thegame.com, or through the free iHeartRadio mobile app.